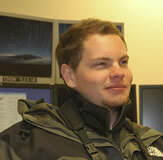 Michael Cooney is currently a senior in Electrical Engineering at the University of Hawaii – Manoa. He is from Kona on the Big Island. His research interests include development of electronics for scientific and end-user use. He works in the Instrument Development Labratory within the Physics department at UH-Manoa doing just that. His current projects involve high energy neutrino detection and a portable audio player. He intends to persue a masters in EE from UH-Manoa in January. The Keck telescopes are high precision instruments requiring tolerances less than a quarter wavelength, typically in the nanometer range. A vast amount of machinery and equipment is required to keep the telescopes operating correctly, all of which create various vibrations. The task of the project has been to monitor the vibrations induced upon the F15 secondary mirrors in both telescopes; in particular those caused by a vacuum system that supports the secondary mirror on the support structure. The vibrations cause displacements in tip-tilt and optical path delay which must then be corrected by other means. Reducing the vibrations reduce the requirements on the other correction devices. This improves the imaging quality for the instruments, particularly the interferometer which is very sensitive to any displacements. The vacuum system is controlled by a regulator that controls the vacuum based upon the elevation of the telescope. The data is collected before, during, and after an upgrade to the vacuum regulator. The results indicate the new regulator reduces some vibrations on the Keck 2 telescope while not effective on Keck 1 telescope.